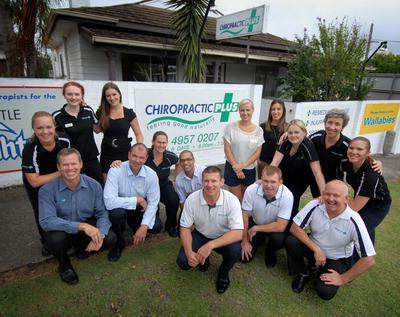 Chiropractic Plus is Newcastle’s leading chiropractic and remedial massage clinic since 1994. Located centrally in New Lambton, NSW, Australia, our team is dedicated to providing natural, drug-free healing for patients young, old and everywhere in between! With three chiropractors and nine remedial massage therapists, we can usually ensure same-day appointments to get you on the path to optimum health as soon as possible. Our chiropractors believe in locating the root cause of any injuries or pain a patient is experiencing, and involving the patient in the education of their condition, explaining everything we do in advance, whilst providing treatment as well as a treatment plan that seeks to ensure the best possible results so that reoccurrence is minimised. If you experience migraines, headaches, any back or neck pain, joint pain, sciatica, numbness or tingling in any limbs, call us or visit our website to make an appointment with one of our experienced chiropractors and benefit from treatment that is widely recognised as one of the safest, most effective ways of treating such problems. For any muscular aches, pains, knots or tightness, book in with one of our highly trained remedial massage therapists. Remedial massage restores healthy function to your muscles and soft-tissue, using firmer pressure and targeted techniques to provide relief, improved movement and healing time for such injuries. Our therapists’ techniques include deep tissue massage, myofacial release, trigger-point therapy and specific stretching advice, to name a few. For the relief from any pregnancy pain and discomfort, our massage therapists are all trained and qualified for specialised pregnancy massage to aid in relieving tension build-up that can cause backaches, a stiff neck, leg cramps, headaches and edema (or swelling). In addition, remedial massage for pregnant patients reduces stress on weight-bearing joints, encouraging blood and lymph circulation to aid in relaxation and a better night’s sleep! Thousands of people from locals, elite sports men and women and international artists have entrusted their health care to our highly trained and professional practitioners. Call us today to join them and feel good naturally!